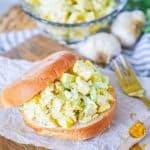 This Curry Chicken Salad is absolutely one of the best easy and on the go meals! It is loaded with tender chicken, creamy curry dressing, crisp celery, and sweet golden apples. 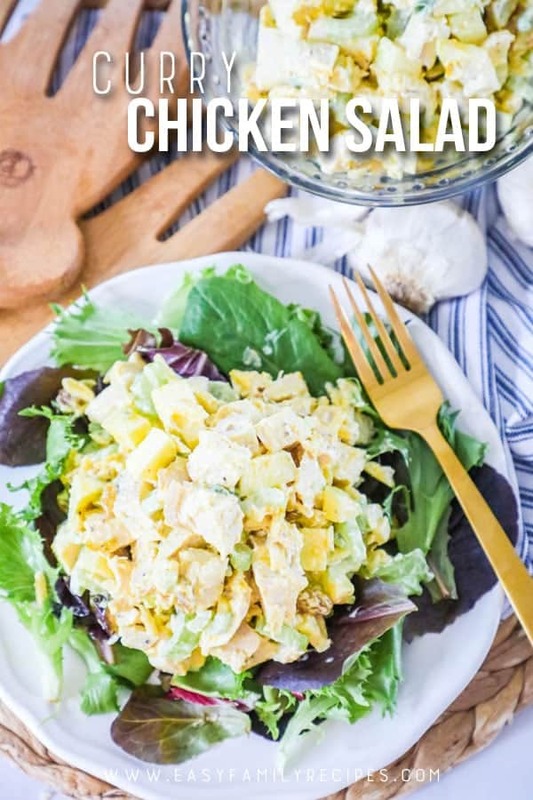 You can make this chicken salad quickly and eat it right away or use it for meal prep and keep it in the fridge for quick and easy meals throughout the week. Inspired by a local bakery, this recipe uses simple ingredients to make this chicken salad that perfectly balances the sweet, salty and curry flavors. You can serve this on salad greens, as a chicken salad sandwich, in a hollowed tomato or avocado, or with crackers. Curry chicken salad is perfect for lunch, dinner or perfect to serve at a brunch or potluck. This recipe is not only delicious, but also naturally gluten free and low carb. I often get questions on how I create my recipes. Inspiration is plentiful, but there are generally 3 main things that help me to create a new recipe. The first is that it is a family recipe that we have been making as long as I can remember. I have shared many of these in the past and am making an effort to get even more of them up, not only to share them with you but have a personal chronicle for our own family. The second way I create many of my recipes is making a twist on one of the classic recipes. If I notice that my readers (you guys!) really like a certain recipe, I will often try to find a way to recreate that same recipe with new flavors. That is exactly why I have so many (and so many SUPER popular) baked chicken recipes! The third way I create a new recipe is when I go to a restaurant or cafe and have something to eat that is so good I just can’t get it out of my mind. That is exactly how today’s Curry Chicken Salad recipe came to be, and I have to say, I might even like it better than the sandwich that inspired it! This Curry Chicken Salad was inspired by a sandwich served in a quint cafe called Shayna’s in downtown Wickford, RI. If you ever go through this town, you HAVE to stop at Shayna’s and get the Traveler! This chicken salad can be served very simply or more elaborately depending on the occasion or how much time you have. I am going to list some of my favorite ways to serve Curry Chicken salad below. I have broken the list down into traditional serving ideas and low carb serving ideas. You can choose one of these or do a couple. If you have another way you like to serve Curry Chicken Salad that I missed, please leave me a note in the comments so I can give it a try. I always love to try new ideas from readers! This is an easy recipe that should come together really quickly for you! I am going to walk through the recipe here in a bit more detail so I can hopefully answer any questions that may come up while cooking. 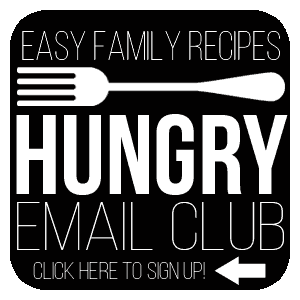 There is a FULL printable recipe card for you at the bottom of this post. 2 lbs boneless, skinless chicken breasts- You can bake or boil the chicken, or to make it easy, you can just shred up a rotisserie chicken. Either shredded or cubed chicken will work, so feel free to chose which one you prefer! 1 cup celery, chopped- I like a fine chop and I really load my chicken salads up with celery. By adding the celery, you get a good crunch and can really bulk up the salad, and add nutrients and fiber, without adding many calories. 1 golden delicious apple, diced- This will be around 1 cup of apple. I like to dice it small so that it is easier to eat. 1/2 cup almond slivers- I prefer the slivers but you could also use sliced almonds if you have those on hand. 3/4 cup mayonnaise- I use regular Duke’s mayonnaise in my chicken salad. 1 tsp curry powder- This amount of curry powder will give the chicken salad a nice subtle curry flavor. If you really like curry, you could add more to taste. Combine the mayonnaise with the curry powder, salt and pepper and mix well. This step helps to make sure that the flavors all get evenly distributed though out the chicken salad. You can also just throw it all in the bowl together, but if you choose the one less dish method, make sure to mix really well to get the curry powder in every nook and cranny so you don’t end up with it all in one spot which would really give a kick! In a large bowl, combine the chicken, celery, green onions, apple, raisins, and almonds. Pour the dressing over top and stir until evenly coated. If you decide you want more celery, or apples, or less or something feel free to take a little liberty here. You can make it to you and your family’s taste! Serve chilled with crackers, on greens, or your favorite way. You can enjoy this salad right away, but you can also let it chill in the refrigerator and the flavors just meld together and get better the longer it sits! Me and my girl friends devoured this Chicken Salad with Curry when I made it this week and the family loves it too! I really hope that you enjoy it as much as we do! 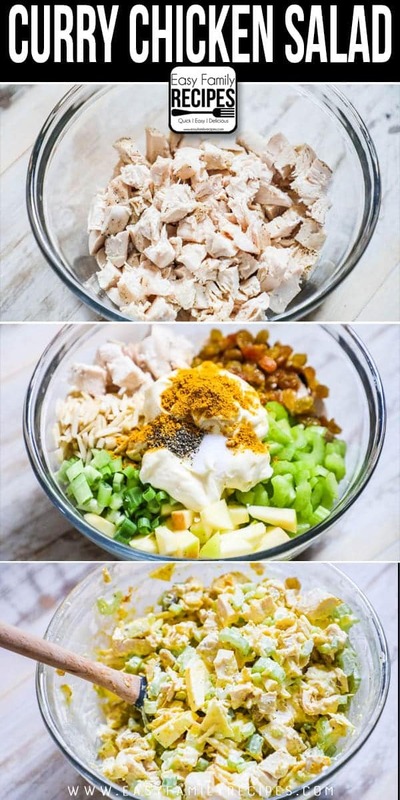 This Curry Chicken Salad is absolutely one of the best, easiest, and on the go meals! It is loaded with tender chicken, creamy curry dressing, crisp celery, and sweet golden apples. You can make this chicken salad quickly and eat it right away or use it for meal prep and keep it in the fridge for quick and easy meals throughout the week. Serve this Curried Chicken salad for lunch, dinner, or at brunch or potluck. In a large bowl, combine the chicken, celery, green onions, apple, raisins, and almonds. Pour the dressing over top and stir until evenly coated. Serve chilled with crackers, on greens, or your favorite way. Enjoy! You can use chicken tenderloins or other cuts of meat in lieu of full chicken breasts or use rotisserie chicken to make serving easier. I have made curry chicken salad since the 70s Secret: add a TB of soy sauce and 1 cup of diced pineapple for a twist. That sounds delicious! I am going to have to try it! Thanks for the recommendation! Please don’t start a sentence ” me and my girlfriends”. Grammar still counts. This does sound like a good chicken salad…a nice addition could be a spoonful or two of chutney. So glad you enjoyed the recipe! Hopefully you can try more of our chicken salad recipes!